GZ2 Galaxy with Bars drawn by users. Bar project stage 1 complete! Dear all, we’d like to thank everybody for making the bar drawing project such a success. We now have enough data to perform some reliable, new & very exciting science. The site will remain open (for future inspection), but the votes will no longer we recorded. 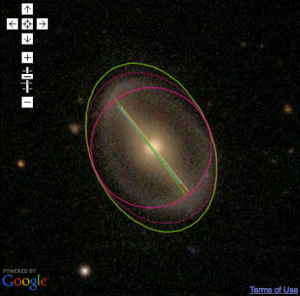 We’d like to take this opportunity to draw your attention to other interesting galaxy zoo and zooniverse projects. We’ll keep you posted about future publications. Once again, we’d like to thank you all! Jolly good show about the finished bar project only – why’s it filed under She’s an Astronomer? Because I wasn’t paying attention to the click buttons….. now to try and fix it ….! Probably because of me. Everything I post get’s defaulted to the She’s an Astronomer category. I think it’s the blog telling me I should write more posts about science!